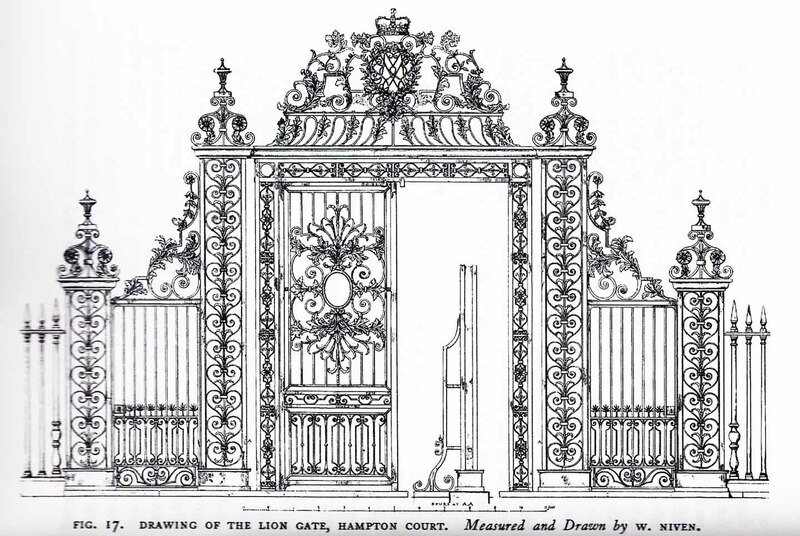 One month on | Restoration of 'Tijou' Gates at Petworth House. One month on from the last post. We’ve been busy, despite the rain, ice and delays. The site is pretty much there now. Our steel containers and office are installed, water and electric are on. 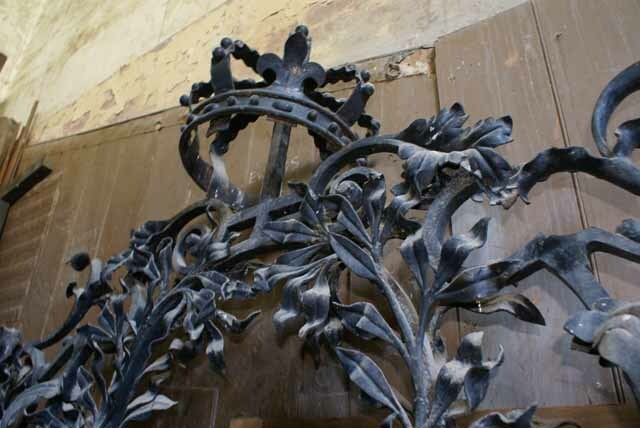 We’ve completed our preliminary cleaning (that’s a pressure wash in layman’s terms) of the existing Ironwork. The scaffold and wrap company are finishing as I write. By the weekend the site will be dry (ish) and secure. The weather is particularly cold today so the total enclosure of the site is quite welcome. The site prep took a week longer than planned, so in the interests of safety, I decided to delay the start of works by a week. So the official start is now Monday 10th December 2012. The ‘first view’ drawing is done. This is the most important and pivotal of the drawings we have to make. It shows the existing structure immediately before the project begins. The drawing is intended to be a working document opposed to a artistic representation (although it is that too). To this drawing, the harvested parts and missing components can be added in a drawn format. This can be done by overlaying or directly editing a copy of the drawing. It helps us orientate ourselves about the structure and communicate our intentions to each other and third parties. The drawing is accurate, but deliberately to an unspecified scale. 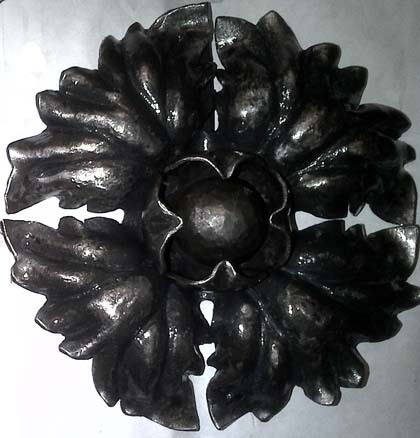 Its important that all dimensions are taken directly from the existing ironwork. 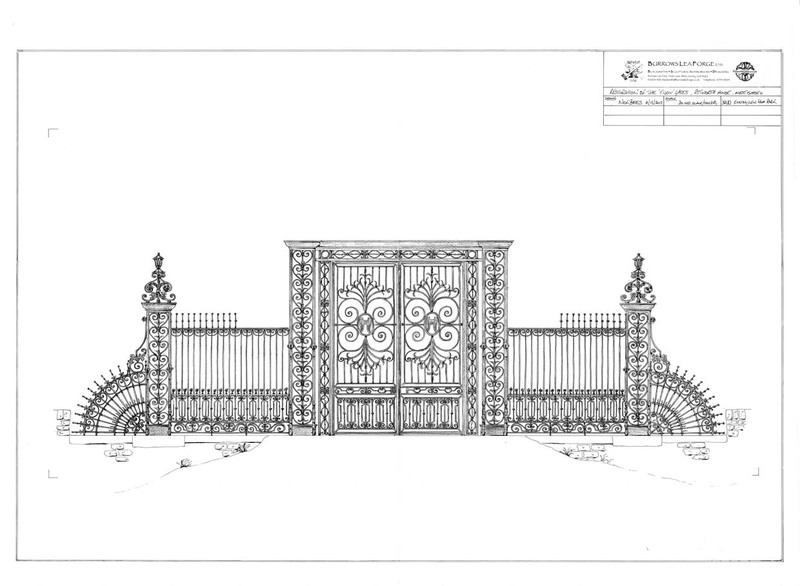 The first job on Monday will be to compare the drawing against the existing Ironwork structure, testing the drawing for later use. Any discrepancies will be edited to the master document. As there is a front and back view on this structure two comparisons will have to be made. This will be followed by taking record photographs of the structure and noting of key measurements. These will be added to the formal report. The National Trust have taken paint samples and the layers inspected by a Historic Paint Specialist. So that job has been ticked off the list. I let you know more when I do. The first week will be taken up with on-going recording and assemble/assess the jigsaw of harvested and missing components, after which a definitive ‘List of Components’ will be compiled. This will help quantify/confirm the new material needed to repair of existing items and manufacture of new to replace the missing bits . This needs ordering ASAP, there is a long delivery time on new Iron so hopefully by the time it arrives we will be ready for it. The list will also help quantify/confirm the labour commitment needed to complete the project. In the tender process these factors had to be estimated. We were thorough in our tender assessment, so our end assessment figures should be close to our tender figures. I’ll let you know for sure at the end of next week! This entry was posted in Uncategorized and tagged Burrows Lea Forge Ltd., Recording. Bookmark the permalink.